Swiftly and smoothly place the LiveChat widget on your Miva store. Talk with all website visitors and deliver faster assistance. LiveChat mobile applications will let you serve your clients also on the go. Effective customer service will result in better website engagement, customer satisfaction, and eventually higher sales. Miva is a cloud-hosted e-commerce platform that facilitates building online shops. The solution can help both small as well as large companies to provide B2B and B2C experience. Designers can make use of responsive and customizable templates. You may upload your pictures, GIFs or films. Moreover, you can adjust layouts to specific products and offers. A simple drag & drop interface enables you to make fast changes: add products’ descriptions, assign them to different categories or create unlimited attributes. If you use Wordpress as a blog platform, you can synchronize it with Miva. Miva takes care of your SEO as well. It gives you well-tailored URLs, lets you offer automatic redirects to other pages and use dynamic meta tags thanks to which your products can get broader search engines visibility. To add to this, the tool supports your sales. You can propose relevant products or offer recently bought items. Offer exclusive deals for B2B clients, adjust prices or assign discounts based on products gathered in the shopping carts. On top of that, Miva can lower cart abandonment by sending auto-emails reminding customers about uncompleted purchases. Thanks to many translations, you can run your business globally. Accept payments in different currencies, provide different taxes or shipping fees. The solution automates multi-channel marketplace inventory as well as payments, orders and credit card processing. Plus, your storefront can be easily integrated with CRMs, ERPs or OMSs. Thanks to LiveChat, you can have a full insight into chats’ success rates. The Sales Tracker will keep an eye on all chats that resulted in a sale. You will know exactly how much money you can earn due to chatting or which agents close the most profitable deals. Missing valuable information won't happen again! With LiveChat on board, you have direct contact with visitors. The solution lets you build a long-standing relationship with them and empower customer loyalty. LiveChat lets you break a curse of cart abandonment. Start sending personalized chat invitations to visitors and carry out more conversations. Advise customers and recommend products relevant to their needs. With LiveChat, you can make their checkout process a painless experience and increase the number of completed payments. You can be sure that with LiveChat all your information is well-protected. Sleep well and be certain that you are the only person who can access all data related to your chats. 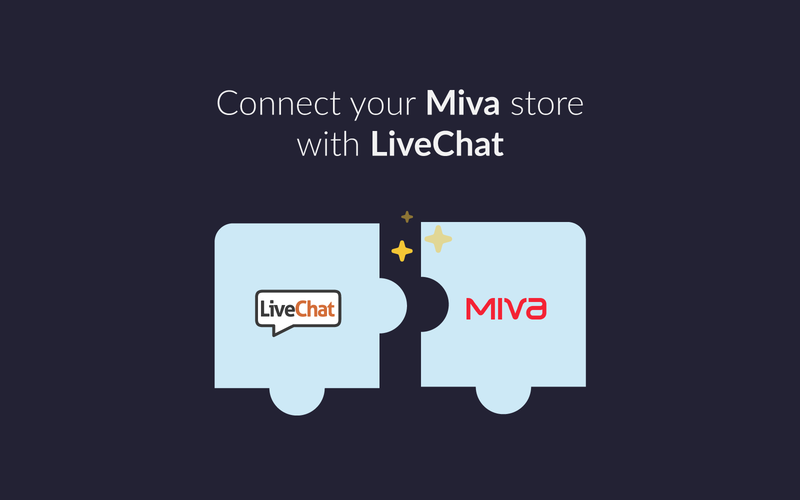 Start using LiveChat with Miva now!